So I was driving in the car with my three sons the other day when the subject turned to Batman. They had recently seen Tim Burtons’ Batman movie for the first time and were introduced to Batman with ridiculously-chiseled abs and pecs. 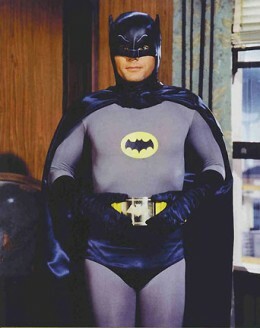 Previously, their live-action Batman experience had been limited to Adam West from the 1960’s TV show. I laughed out loud at this last comment. Then they moved to the costume. “He looks like he’s wearing a diaper”. Here at Lost Transmission – a bastion of retro appreciation – I do have a sense of humor. It’s true about Batman. Adam West was a bit frumpy, and he did run like he’d just polished off a couple of Chicago dogs for lunch, but you have to love the original Batman. Here’s one thing my kids agreed on…the old Robin was pretty good, but the villains in the original Batman were awesome. In fact, the boys are already plotting a “Batman villain” Halloween for 2011. They will be going as the Joker, the Riddler, and the Penguin…the TV versions. I guess dad will have to dress up as Adam West.